Much like Christo and Jeanne-Claude, the artist-itect couple Arakawa and Madelaine Gins never seem to fade away. They just build bigger and more outrageous projects. This we can respect. Brand Avenue points us to an interesting article in the Japan Times interviewing Arakawa about a crazy gerbil-city of apartments he designed in Tokyo. He and his partner's work is obsessed with architecture that "defies death", in the sense of defying expectations, therefore bringing back to life original, direct sensory perception. In this case, it means hanging all your clothes from hooks on the ceiling (accessible by non-moveable ladder), light switches at your ankles, and bright colors. It really opens the place up, don't you think? 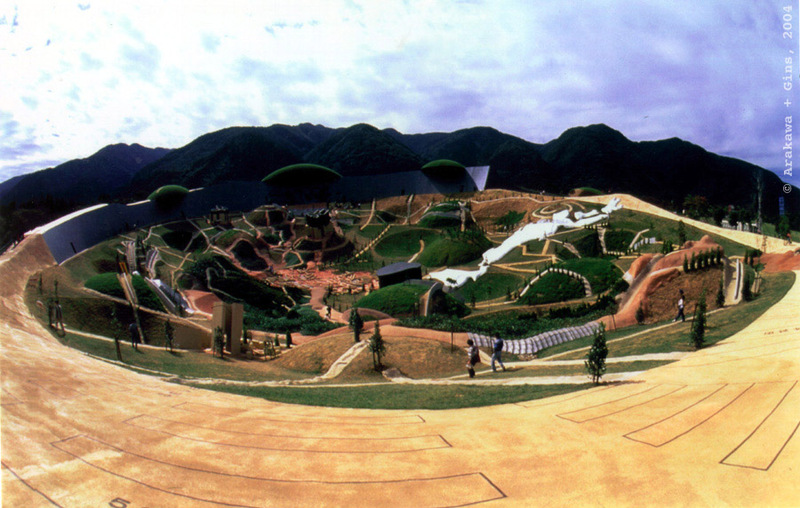 Their website has more hidden gems, including the weird-yet-in-East-Hampton Bioscleave House, and the weird-yet-great-website park called Site of Reversible Destiny (pictured above). The latter seems like a more suitable ground for this kind of exploration. It's like a jungle gym for adults. The living spaces, while interesting exercises, seem to dominate the inhabitants with the artist's idea of what constitutes living. Tropolism means taking pleasure in Habit.